Sometimes God wants to see if we are willing to follow him to places we’ve never been before and do things we’ve never done before. But before we can answer the call, we first have to believe we can walk on the water. Scripture says the disciples were terrified when they saw the figure walking on the lake, but when they realized it was Jesus, only Peter was willing to try out water walking too. Jesus called Peter out of the boat. He was with him when he took that first step onto the wave and was with him every watery step after that. He would have won any international surfing competition, hands down. However, when Peter took his eyes off Jesus, he began to sink. When we are called by God out of the comfortable box we live in, like Peter, we have to overcome our insecurity and first believe we can do it. However, the second step is more important than the first. We have to know that we can’t make it in the unknown without remaining connected to Christ. What is the unknown for you? It could be a move. It could be a mission trip to a foreign country. It could be a life alone after the death of a spouse. It could be a new job. It could be a battle with disease. It is any place you have not been before. Jesus says we can all be water walkers. I am currently water walking in ministry. God has pushed me out of the safe confines of my church to meet other Christian women across the Dallas/Ft. Worth metroplex. While I am outgoing, I am actually a naturally shy person, so networking is not that comfortable for me. It is a water walking experience. Before I go to any event, I pray for favor and that the love of God will flow through me to all of the new people I meet. I also let God dictate who I’m supposed to connect with. Because of that, I view each person I meet with as an appointment the Lord is setting up for me. God has called me out of the boat and in order to walk on the water, I have to stay focused on him. One of my favorite verses is Philippians 4:13: “I can do all this through him who gives me strength.” I may not be able to handle the unknown by myself but with Christ holding me up, I won’t sink. No matter what the unknown looks like for you, if God is calling you there, then you can know he will provide the strength you need to get through it. 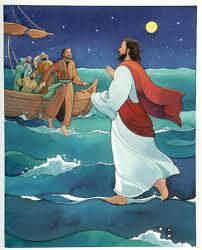 If he’s asking you to get out of the boat, are you willing to trust him like Peter did? Or will you never know what it’s like to be a water walker? And there in the center of the table, bread appeared. We couldn’t believe it. 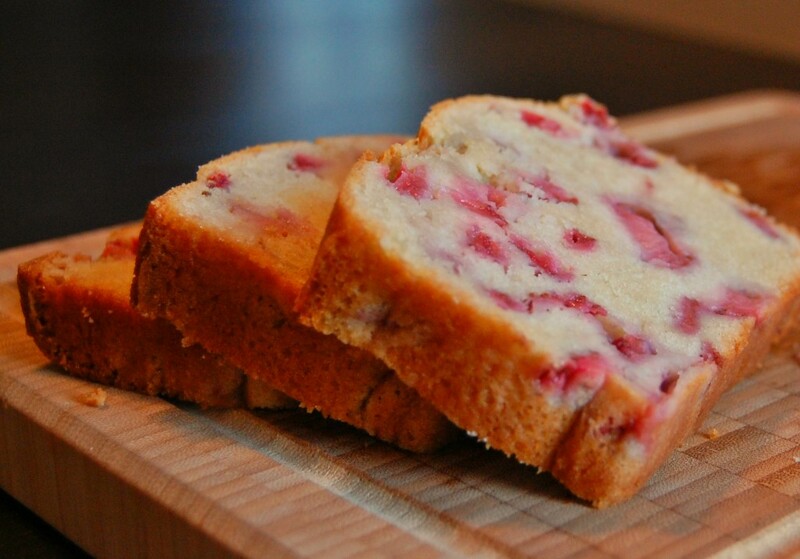 After our small group Bible study prayed for God to give us our daily bread, we opened our eyes and saw strawberry bread before us. Our Bible study met at a new café in the area and it was actually a sweet gesture by the manager to bless us with complimentary bread, but we also saw it as God’s reminder that he hears our prayers and sometimes, he gives us a quick answer. God never intended for us to take life more than one day at a time. When the Israelites wandered in the wilderness, God fed them with flakes of manna from the sky but they were instructed to gather only what they needed for the day because it would spoil at night. In the same way, the Lord wants us to come to him every day with our prayers and needs because he wants to spend time with us every day and knows life can be overwhelming if we don’t. I find my most anxious days are when I am more concerned about the future than the present. When I worry about next year rather than today. When my brain fills up with a truckload of scenarios rather than the reality of this day. It’s important to surrender our hopes and dreams to the Lord each day so we can receive his new mercies. A daily dose of Jesus. When we turn over all our concerns to the Lord before we ever start our day, the anxiety about the day calms down. That’s not in the Bible by accident. Jesus knew we needed to be reminded not to dwell in the future. This Lenten season I am going to ask God to help me, a girl who has a propensity to worry about what’s down the road, to make the present my home. I am going to ask for daily manna from God and let that be enough for 24 hours. Today’s guest blogger is Kathy R. Green. 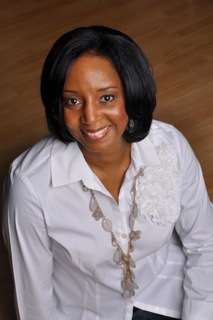 Kathy is an author and speaker with a passion for prayer and helping women leave the pains of their past. Since giving her heart to the Lord at the age of 10, Kathy immediately felt drawn to spend time with God. Her life has been transformed by the power of prayer. In 1996 God gave Kathy a mandate to teach His people how to pray and intercede for their loved ones. Since that time Kathy began writing and teaching on the subject of Prayer. She has authored two books – Pray-ers Bear Fruit, and Come, and she also leads a weekly prayer call for Shulamite Women magazine. Kathy and her husband Cliff have been married for 28 years. They have two adult children, a son-in-law and a granddaughter. For more information about Kathy, please visit her website at KathyRGreen.com. The Lord spoke those words to my heart while praying for a dear friend in the midst of a difficult situation. During a storm, circumstances have a way of appealing to our senses in a very real way. So staying light can seem like a challenge. When we face tests and trials, some of us have a tendency to over-think or over-analyze the situation as we try to figure out a solution. But by doing so, we take upon ourselves the burden of resolving the issue, when coming up with a solution is not our concern or responsibility. Through prayer, Jesus has extended to us an open invitation to bring our burdens to Him as often as necessary so that He can carry the load for us. My husband and I enjoy going shopping together. Sometimes we’ll slip away in order to go to our favorite departments, but there are times when my husband waits patiently for me as I look around. During those times I can always count on him to reach out his hand and take my purse or whatever I’m carrying, so that I can move about feeling light and free. A gentleman will always carry the heavy stuff for a lady. As daughters of God, our Father in Heaven wants to carry those things that are too heavy for us. We can go to God in prayer with the weight of the world on our shoulders, and come out feeling light and free when we cast our burdens upon Him. To cast something off means to throw it or fling it away. Even if we have to do something practical to help remind us we are no longer carrying the load, we must do whatever it takes not to pick up the burden again. So after we’ve prayed and given our burdens to the Lord, we can take another step and write the burdens we’ve released on a piece of paper, then ball it up and throw it in the trash, or burn it. This is how we disassociate ourselves from the burden. Whenever I find myself dragging and feeling heavy or oppressed, I’m suddenly reminded that I have not cast my cares upon the Lord. God doesn’t force us to unload our burdens on Him. He simply waits for us to come to Him. And when we do, He has promised to sustain us. That means He will hold us up and give us the support we need to come through the situation without falling or failing. Isn’t that wonderful? Has a situation left you feeling heavy and burdened down? If so, take your burdens to the Lord in prayer. Let Him carry the weight of the situation for you. God wants you to master the art of keeping it light. Do you believe God is a promise keeper? God promises if we trust in him he will direct our paths. He promises he will be with us until the end of the age. He promises us we are his children. He promises his love to us. God’s promises never fail, but sometimes we fail him when we don’t trust his promises. The prophet Jeremiah’s life is an example of a promise kept. Jeremiah was commissioned by God to speak truth to the people of Israel, truth the Israelites really didn’t want to hear. They had placed thousands of other gods before the one true God and God wanted Jeremiah to warn them they would be carried off into captivity by the Babylonians if they did not repent. In the course of his discourse, Jeremiah’s life was threatened, he was thrown in a dungeon and lowered into a muddy cistern. Through each trial, Jeremiah never forgot that God promised he would rescue him. Do you wonder if Jeremiah finally questioned the promise as he was chained and being led off to captivity in Babylon with the rest of the Israelites? Why wouldn’t he begin to doubt? But there’s no evidence he did. Then King Nebuchadnezzar himself told the commander of his imperial guard to find Jeremiah and release him. Jeremiah was told he was free to do whatever he wanted. God kept his promise to Jeremiah and rescued him from captivity. Sometimes when we are in the thick of difficult situations, we start to doubt God’s promises. We have to remember if we have God in his rightful place in our lives, God is a promise keeper, no matter how bleak it might look. When we doubt, we should go back to his Word and remind ourselves of the promises, then trust God will not fail us. Our past shapes us but it should not paralyze us. While I am a forward thinker, I can sometimes let the past overtake me as I press on into what God has prepared for me. Past dysfunction, past hurts, past relationships gone awry. As my mind spins backwards, my emotions also plant themselves in the past and I begin to relive a time that God either healed me of or brought me out of. Why is it so difficult to forget the former things? Instead of embracing the new thing God is doing in our lives and showing gratitude, we have the past super glued to our brains and let it create a heavy weight for all to see. But, we can’t let the past rule us. What’s ahead is more important than what’s behind. I will never look at my car the same again. She was right. Did I not perceive it? 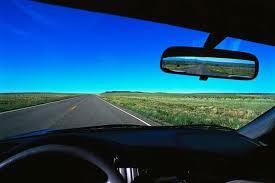 God was doing a new thing in my life and the past was in the rearview mirror. The future was expansive and hopeful. Do you dwell on the past rather than on how the Lord has brought you out of it? Is there a current situation bringing you down? Try flipping your thought process. Praise God for how he brought you through the trial and for the new thing he did in your life. Then praise him in advance for how he will bring you through the current difficulty. Yes, I believe God uses our troubles to shape us, but once he brings us out of them, we should press into the positive. When we hold onto the past, it’s a waste of time and energy. God loves you. He will not let you toil away in the valley for too long. If you are in the thick of a trial right now, trust he is preparing a new thing for you. Once he brings you through it, don’t look back, except to see how far he’s brought you.